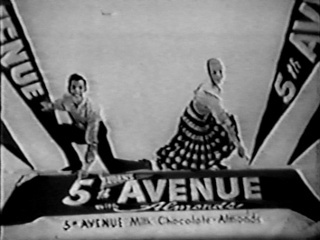 Here’s a commercial for 5th Avenue candy bars from the 1960s. This ad was first seen in 1960, and often shown on “WALT DISNEY PRESENTS”, as Luden Candy (who marketed the bar at that time) was one of their “alternate sponsors” that season. They used “Skip To My Lou” as the basis for their jingle that year, usually ending with the tag, “Look for the big ‘five’ on the wrapper- THAT’S 5th Avenue!”. I’ve seen another version of this commercial, probably on my compilation tape “Those Crazy Old Commercials”, which had young children on a playground. The tune & lyrics were identical to those in this commercial, though it was perhaps a different arrangement. Jehosaphat! I remember Fifth Avenue Candy Bar. (I also remember Milk Shake Candy Bar). Don’t figure out my age, LOLOLOLOLOL.